“No,” I sighed, awkwardly shifting as I stood in line. “Korean,” I muttered, feeling my face turn hot. “I’ve never heard of ‘Kreeyan.’ You’re nothing!” And with that painful exchange on my first day of kindergarten, my classmate turned away to chatter with another child. Until that day, I hadn’t thought much about being a Korean girl growing up in the U.S. My parents had emigrated from Seoul before I was born. At home, I moved relatively seamlessly between my family’s Korean culture and the Americanisms I tried to embrace. Didn’t every Korean-American child tell our parents about the Tooth Fairy and then still act surprised when we found money under our pillows? Didn’t we all do our New Year’s bows and then spend the change our elders gave us on games of Ms. Pac-Man at the arcade? I did realize that one aspect of my childhood was different from those of my Caucasian friends. My bedtime stories weren’t about princesses and dragons, Goldilocks, or the Three Little Pigs. Instead, my parents tucked me in with what they liked to think of as “life lessons”—stories about suffering through the Korean War, injustices they spoke out against as young adults and racism they experienced as immigrants in the U.S.
From a very early age, my parents instilled in me the importance of advocating for the nonviolent and ethical treatment of all people—regardless of political affiliation, religion, race, gender or any other seemingly arbitrary divide that put one group against another. And they did a great job. I took to heart the horrors they endured growing up during a civil war coupled with the racial slurs they unsuccessfully dodged after they immigrated. During high school, I spoke out against violence, war and the environmental degradation that caused the Endangered Species list to grow. Yet, my parents also hammered into me the need to be secure and successful, so while they supported my early foray into activism, they stressed the need for me to join the upper echelons of professional career women as a doctor or a lawyer. Until halfway through college, I was on that path. I attended anti-violence rallies and helped cook meals for homeless individuals in between running to my philosophy (for me) and pre-med (for my future) courses. I was straddling what I regarded as completely separate worlds of nonprofit advocacy and for-profit security. Then, one week after my father and I caught 300 pounds worth of bluefish—I have no idea how many individual animals we pulled out of the bay that day—I got a pamphlet in the mail. I had already been a supporter of Greenpeace (for the dolphins), World Wildlife Fund (for the pandas) and Amnesty International (for the people), so I had no doubt that I was already doing so much to make the world a better place. Reading that double-sided brochure truly changed my life. For the first time in my 19 years, I thought about the animals raised and killed for me to eat. I read about factory farming, stared through watering eyes at photos of intensive confinement and slaughter, and realized that unquantifiable amounts of suffering and pain were being inflicted on individuals just for me. I wish I could say that when I was six years old, I felt uncomfortable with the thought of animals languishing in crates, pens, stalls and sheds, waiting to be my breakfast, lunch or dinner. But, I can’t. Like most people, I had never thought about the way animals raised and killed for meat, eggs and milk were treated. I had no idea that ten billion land animals (according to today’s staggering statistics) are killed in the U.S. each year to stock our grocery stores, restaurants and kitchens. Yet, that little piece of unsolicited mail took my ignorance away from me. I knew that in order to be consistent in my beliefs, I couldn’t draw a line between humans and nonhumans. If I did, I would be guilty of the same prejudices held by those who yelled at me, “Go back to China, you gook!” All animals can feel pain, excitement, boredom, frustration and, most importantly, can and do suffer. Given the sheer numbers of animals raised and killed for human consumption each year, I decided that working to improve farm animal welfare was the most effective way I could reduce suffering. With the same steely determination I had applied to my pre-med studies, I threw myself into examining factory farm production systems and the toll exacted on animals. Given that, of all farm animals, chickens are raised and killed in the greatest numbers—one million “broiler” chickens slaughtered every hour with nearly 300 million egg-laying hens overcrowded each year inside wire battery cages, unable even to flap their wings—reducing their suffering has long been a priority for me. Indeed, nine billion birds are slaughtered annually to feed the average American the 84 pounds of chicken meat and 252 eggs consumed in a single year, and each of these birds endures a life of frustration and pain. Chickens are only one group of animals who need protection. Within agribusiness, the animals’ welfare is severely compromised by factory farming practices, as the economic interests of the producer often conflict with—and generally take priority over—the animals’ well-being. I found myself nearing college graduation with my hand outstretched toward a philosophy degree and my mind wondering about the future, much to my parents’ chagrin. I was torn between wanting to please those who had expectations of me and my growing desire to work full-time as an animal advocate. The struggle I wrestled with ended without much fuss. Since 1992, I’ve worked for nonprofit animal protection organizations to reduce the greatest amount of suffering for the greatest number of animals as much as I can. My work has revealed to me the most amazing ability humans have, which is our means to change. Every day, we make small choices that have far-reaching consequences. When we sit down to eat, we are making such a choice: Do we want to add to the misery in the world or add to the kindness? It’s truly that simple. 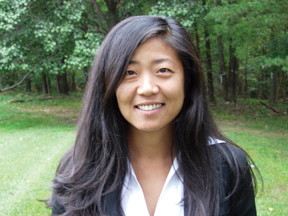 Miyun Park is vice president of Farm Animal Welfare at the Humane Society of the United States and the former president of Compassion Over Killing. To learn, visit HumaneSociety.org.